Members of YBA have recorded this toad during the recent field trip to Peak wilderness. Adenomus kandianus has first recorded by Günther in 1872 from Peradeniya. 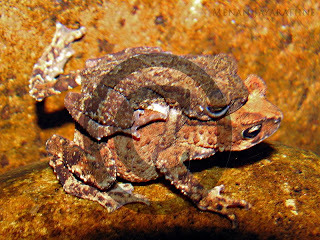 This endemic toad was considered as extinct because it has not been recorded for over 130 years. Most recently Mr Mendis Wickramasinghe who is a well known naturalist in Sri Lanka revealed that this species is still survives in the wild. Presence of web in the hind limb is a unique feature that help to distinguish it from other members of this genus; Adenomus dasi and Adenomus kelaarti.